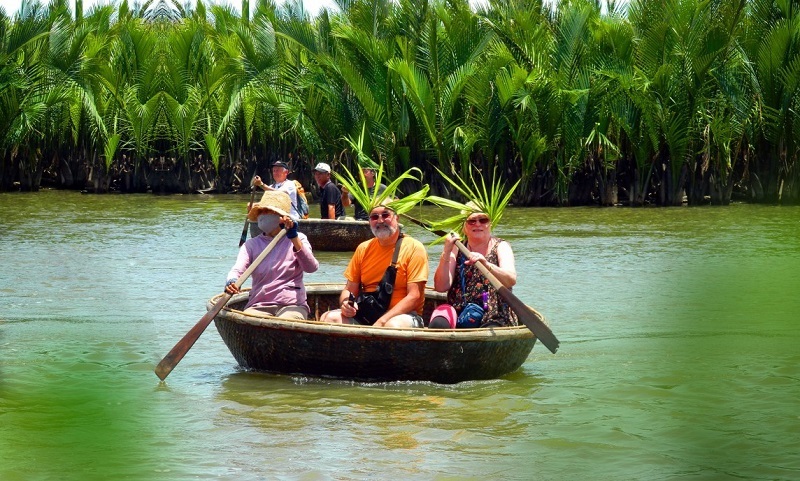 Traveling to Hoi An, visitors not only get to be discovered the world cultural heritage with peaceful old town, but also have an opportunity to experience fun and exciting discoveries in Bay Mau coconut (nypa fruticans) forest, also called " The Mekong Delta inside ancient town’s heart". Bay Mau coconut forest in Cam Thanh, Hoi An (Quang Nam) with vast space, wild nature, immense river will make any visitors feel like lost in the West of Vietnam. If you want to have a fun trip to find the feeling of relaxation, harmony in nature can visit this coconut forest. So let’s refer to some travel experiences as below. If you want to discover Bay Mau coconut forest, just ask the reception of any hotel for visitors to the telephone number of the organization dedicated to visitors to this visit. From the ancient town of Hoi An, tourists swept southeast to the Hoai River about 3km to come this forest. Or you can go to the sea along Cua Dai, to the De Vong River there also have units to welcome visitors. Bay Mau water coconut trees are tens of hectares lying next to De Vong River, Thu Bon river and Hoai River in Cua Dai area. Being a brackish water area, it is very suitable for growing coconuts. What is special about Bay Mau coconut forest? Visiting Bay Mau coconut forest you can participate in fun activities here. You can spend a day relaxing in this cool coconut forest. From the large boat, about 30 meters from the coconut forest, visitors will be taken to the boat to crawl into the coconut forest. Each row boat with 2-3 tourists and a paddle, so slowly surfing into the coconut forest to explore. Here, visitors will be instructed to make small toys, beautiful leaves from coconut water for visitors such as eyes, a ring, a hat … to visitors as souvenirs. On the occasion of the 8th lunar month, if visitors come to Bay Mau coconut forest you will see coconut water ripen and this is also a specialty for visitors to enjoy coconut water crunchy, sweet and very delicious. If you would like to be pampered for relaxation and sightseeing, you should rent a room in the nearby hotel. After visiting the coconut forest you can return to the hotel to relax and enjoy the delicious food here. What to eat when visiting the Bay Mau coconut forest? Come to the Bay Mau Coconut Forest in Hoi An, you must enjoy the most delicious dishes as shrimp, crabs, fish… You also can try some dishes like Cao Lau, mixed rice cake, Hoi An chicken rice, fried mussel cake, wonton etc. Especially you should enjoy famous chicken rice in Hoi An. This is a delicious food that many people love to eat beside “cao lau” Quang noodle when coming to the old town. Coming to Hoi An you can easily find a good chicken rice restaurant from the popular restaurant to the high-end restaurant, there is even a chicken rice street in Phan Chu Trinh street (many shops), close to the old town, very convenient for tourists to eat. With the best recommend, a Hoi An tour at Vietnam is always the top choice for the tourists in Vietnam holiday packages.